Cette 3BD / 2Ba Chalet prendra votre souffle avec vue sur la montagne incroyables et vie privée. Chaque chambre est spécialement conçu pour votre confort à l'esprit. Nouveaux lits avec des couettes en duvet euro, meubles de décorateur, avec des lampes Tiffany et téléviseurs à écran plat., Et Internet sans fil. Salle de bains à partager, pour votre plus grand plaisir, de beaux draps et lampes reverspainted, signés par l'artiste ..
2 lits simples w / couettes en duvet, des oreillers et une lampe Tiffany Dragonfly pour que vous appréciiez. signé par l'artiste, toutes les œuvres créées par les propriétaires Elfi et Jon. My two friends and I loved the place! My friends kept telling me what a good job I had done picking it out - but really, all credit to the owners. The kitchen was particularly well equipped, and we used the gas grill on two evenings. Our hosts and their dog were warm and friendly. The included parking pass made Vail especially convenient, and Beaver Creek is right down the valley. The hot tub fit three; four would have been probably too snug. With three guys, we each got our own bedroom. Would really be a perfect layout for two couples with a kid each, where the kids could share the 2 twin beds bedroom. My wife and I stayed here along with our 3 kids and it was excellent. Jon and Elfi are super kind and gracious hosts. They live on the 2nd floor and the 3 bedroom rental is on the 1st level. It was beautifully decorated, very comfortable and is about a 7 min drive to Lionshead parking. The beds are super comfy. The living room furniture and cozy blankets made it feel like our own mountain home. They paid attention to every detail and were very helpful to us in both planning our arrival and during our stay. Thank you so much Elfi and Jon! We hope to stay with you again soon! We spent another two weeks with our friends Elfi and Jon Devaney in their beautiful chalet in West Vail in early January 2019. 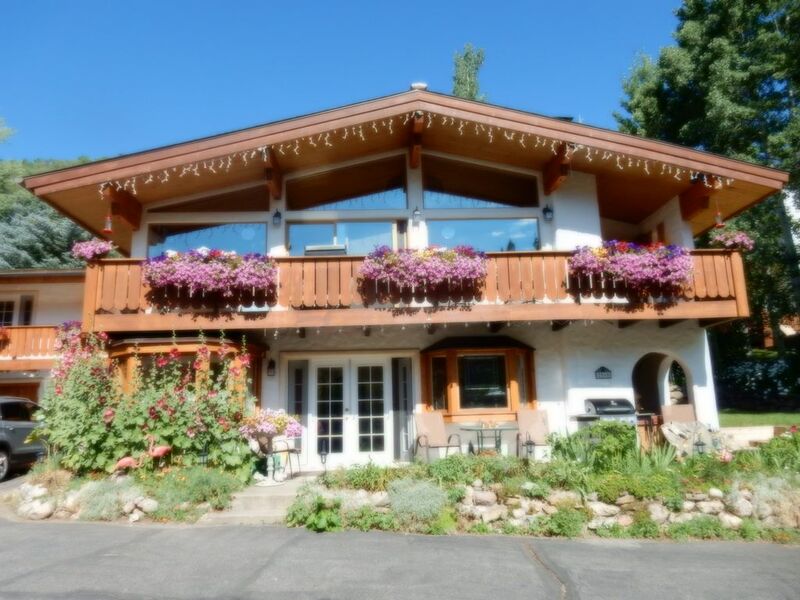 We have stayed here several times and consider it our ideal ski vacation home. The apartment is spacious and very comfortable, the location close to the ski lifts and in a quiet location with good sunlight, and the hosts are very accommodating. Whether you want to relax by the fireplace, prepare dinner on the grill, or soak in the hot tub, this apartment has all the comforts and amenities to offer you and your family the optimal vacation enjoyment. We highly recommend it. Thanks Jon & Elfi for another great year at your Bavarian Chalet. We love your place and your hospitality is the best in Vail Valley! We Love the James Family ! big smiles when the arrive …. 5 Stars all around and please come back soon!!!! As always the stay and experience is exceptional. Our hosts are the best in class. See my comments above !